The North South pipeline was announced by the Victorian Labor Government in 2007 to take water from the Goulburn River on the North side of Great Dividing Range and pump it to Melbourne in an effort to secure Melbourne's water future. The pipeline is part of the Victorian Governments Foodbowl Modernization Plan, which involves upgrading some of the leaky irrigation infrastructure. The government claims that this will save 225 billion litres of water and use this as justification for taking what they call Melbourne's "75 billion litre share" of the water. 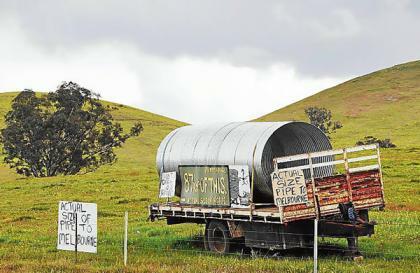 The pipeline has been opposed from a group called Plug the Pipe, who, with support from the Victorian Farmers Federation, claim that there simply isn't enough water to take. The Plug the Pipe group has significant support from farmers and other rural and remote Victorian people and businesses, as they believe that their whole livelihoods will be taken away because of the lack of water, which is essential to farming and food production. It is inappropriate to take water from the depleted Goulburn River (and hence the Murray Darling Basin). Over 160,000 tonnes per year greenhouse emissions will result from pumping water over the Great Dividing Range. The Goulburn River supplies "Victoria's Foodbowl", which provides a large proportion of Australia's food, both for domestic consumption and export. The Goulburn water system is already in crisis due to water scarcity. On the 20th October 2006 the Victorian Premier released a report "The Central Region Sustainable Water Strategy" in which the government claimed it wasn't viable to take water from the Goulburn Valley to Melbourne. The CSIRO have since released several reports stating the same and commenting on the detrimental effect it would have on both the environment and the agricultural production which contributes so much to Victoria's economy. The Victorian Auditor General has released a report concerning the government's lack of accountability in regard to the project and its unwillingness to conduct the appropriate environmental and fiscal studies to justify the projects claimed benefits to the communities. 70% of Victoria's 79 municipal councils have also voted in favour of the project being halted until proper investigations are conducted. 18 megawatts of power will be required to pump 300,000 tonnes of water over the Great Dividing Range each day. This is 28% of the power generated by Guthega hydro-power station in the Snowy Mountains. The Coorong Lakes near the Murray River mouth in South Australia desperately need 60GL a year water to survive. Some of the water derived from the pipeline will end up being flushed by the Gunnamatta ocean outfall rather than recycled. It has been reported that water bills for Melbourne households will almost double over the next five years. Water price plans released by the Essential Services Commission show metropolitan water providers will charge between 87 per cent and 96 per cent more for water. Water Minister Tim Holding, has stated that Melbourne residents need to help pay for major water infrastructure projects, such as the North South (Sugarloaf) pipeline and the Wonthaggi desalination plant. Unfortunately, the community will be forced to pay for these projects, whether they want them or not, without any consultation or serious consideration of alternatives such as domestic water tanks. It appears that the Brumby Government is prepared to write of constituents in rural areas such as Yea and the Goulburn river catchment in an attempt to find more water for Melbourne. However, the water the pipeline will actually deliver is questionable. Federal Environment Minister Peter Garrett has given the project a green light and endorsed it. However, the Australian Senate may block (or amend) the pipeline proposal. The Coalition and Greens have vowed to amend a federal water bill to block the project, with concerns that the project is in violation of the intent of the entire national water plan as it will take water away from stressed farmers and from stressed rivers. Victoria's water officials are preparing for the controversial north-south pipeline to deliver much less water than promised, under new water supply forecasts for Melbourne. Despite earlier claims the pipeline would deliver up to 75 billion litres of water to Melbourne each year, authorities privately believe it will struggle to supply half that amount in its second year of operation, 2011. Forecasts of drastically lower flows are due to reduced expectations over the amount of "water savings" that can be achieved by irrigation upgrades in the foodbowl district in the state's central north. The only year the pipeline is expected to achieve its goal of delivering 75 billion litres to Melbourne is 2010, the same year the Brumby Government will seek re-election, because that water has already been saved by other irrigation upgrades. But from 2011 onwards the officials expect flows to fall significantly as the pipeline will rely solely upon savings in the foodbowl district. On 22 April 2009, a consultant's report was published that cited lower-than-expected flows down the pipeline as a major reason behind a predicted 159 billion-litre fall in available drinking water supplies over the next four years. The shortfall is equivalent to about six months' typical consumption in Melbourne. The report has cast fresh doubts on the $600 million-plus pipeline's ability to alleviate shortages. This occurred on the same day households were warned of massive water price rises to pay for the pipe project and other anti-drought measures. The information on price rises came from data used to set new household water prices, which were yesterday predicted to soar by between 70 and 84 per cent over the five years to June 2013. No pipe poster "there are better options"
This page was last modified 12:45, 31 May 2010. This page has been accessed 117,911 times.